A few weeks ago I wrote a summary of our November trip to Nigeria. I mentioned that we left some money to finish the new classroom building at GoodNews Christian School. We had helped with the expense in the beginning and I knew before we went that they were close to completion. We left home with the intention of taking enough with us to get the job done. Here are two pictures of the new building from our day long visit to the school while we were in Nigeria. Bro. Shobanke sent an email last week with this picture of the completed building. 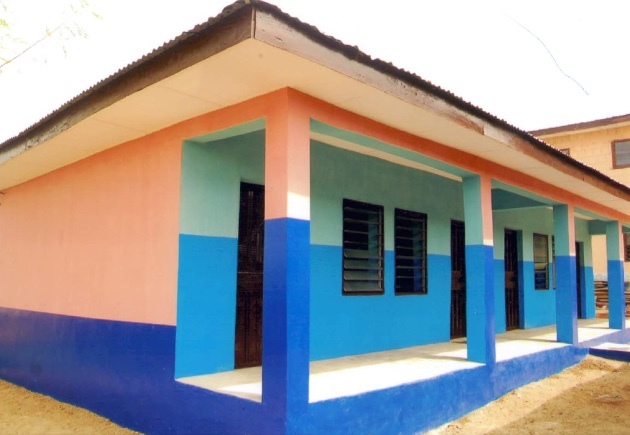 These new classrooms will give the school just enough space for the children they have now. Once the enrollment grows (And the enrollment will grow), they will be overcrowded again. This is the last open piece of ground they own so the only way to move is UP. They built this building with the future in mind. The foundation and walls are prepared for a second story when the time comes. We intend to be prepared to help with the second story of this building when they are ready to proceed. We are also helping them pray that one of the properties on either side of the school will become available at a reasonable price. That would be way cool too. Bro. Shobanke sent a note along with the picture. He wanted me to make sure I said thank you to all the great folks that make all of this possible. I will post his letter of appreciation below so he can tell you himself. As all of you must realize, we could not help them without you sending us, so all the real thanks goes to God's people. May God bless you for loving the saints in Nigeria and taking the time and effort to love them through us. If you want to know more about our friends in Nigeria you can click our Missions-Nigeria page at any time. I greatly appreciate God again for using you for His glory to complete the new two class rooms of our Christian school. You have been a great blessing to us since 2007. We appreciate you, your wife and sister Odie and those that are supporting your ministry. Please thank them all for their help. Please tell your wife and sister Odie I say hello.